The one and only Norma Jeane Mortenson adorns this gorgeous 7 3/4-inch wide x 6 3/4-inch tall x 4-inch long Marilyn Monroe Black-and-White Gen 2 Fun Box Tin Tote featuring an iconic image of the Hollywood superstar. Ages 14 and up. 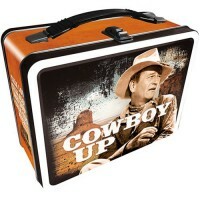 John Wayne Tin Lunch Box - Cowboy Up Click images to enlarge. Pack your lunch or carry your su..